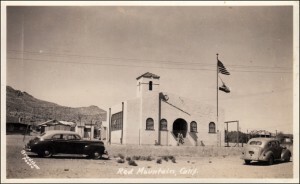 The Red Mountain School Building. Built at an unkown date in the Spanish American style. 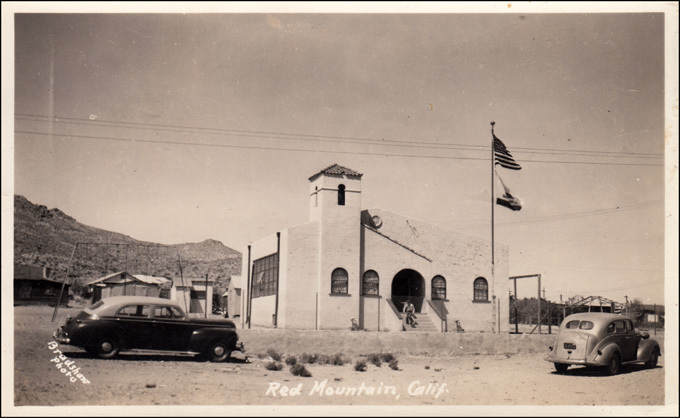 Bradshaw Postcard collection of the Rand Desert Museum. May 27, 1924: “Osdick School Will Have Closing Program—Commencement exercises for the graduation of Osdick Grammar school pupils will be held Wednesday evening, May 28, at 7:30 o’clock at the Osdick Pavilion. The class motto of the graduating students is “Keep Smiling,” and the class colors green and pink. February 9, 1925: SCHOOL DISTRICT CONSOLIDATION IS SNOWED UNDER IN SPECIAL ELECTION – Osdick Voters Cast Ballots Heavily Against the Proposal—Consolidation of the Randsburg-Johannesburg districts of Kern County and the Osdick district of San Bernardino County failed to carry in the special election to ascertain the wishes of the voters in the three divisions, according to long distance telephone received at the office of L. E. Chenoweth, county, superintendent of schools today. In the Johannesburg district of this county 28 voters cast ballots in favor of the proposed union school district against two voters balloting in favor of the negative. At a late hour today the Randsburg district had not been heard from, although the returns from this district can in no way affect the future of the election, as the state law specifically sets forth that the election must carry in each and every district. A report from the Osdick district of San Bernardino conveyed the information that 72 persons had voted against the proposed union and 18 for it. Even though the ballots of Randsburg showed a plurality in favor of the proposed district, the failure of the election in Osdick negates the election proceedings. The movement for the consolidation of the three school districts was said to have been initiated by R. R. Dinsmore of the Randsburg American Legion.